Note! These instructions are for accepted manuscripts only. Manuscript preparation. Please consult a recent issue of Acta Mathematica to get a general idea of the style and layout. Note that changes other than typographical must be approved by the editor in charge. Note also that we are quite careful with the bibliography. We therefore ask you to fill in any missing data in the reference list, update the references as much as possible, and delete any reference that is not relevant to the current version of your paper. When revising your manuscript we ask you to take these author instructions into consideration. Colour figures. 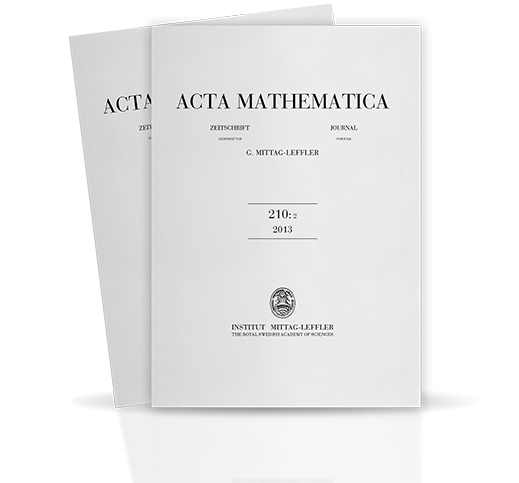 Acta Mathematica is printed in black and white. If you wish to have figures printed in colour, you have to be prepared to contribute to the extra cost. In the online version colour figures will appear free of charge. If you have colour figures that will be printed in black and white it is important that they are clearly visible in greyscale. Abstract. Please make sure that your paper begins with an abstract. The abstract will not be printed, but it will be used on the web. Each paper in Acta Mathematica is presented with abstract and bibliography on the web. File preparation. The name of the TeX file should be the surname of the (first) author with the extension .tex. If the surname has more than eight letters, use only the first eight. Any macros and non-standard style files should be included. Figures should be submitted separately as encapsulated postscript (.eps) files. File transfer. All files are handled through EditFlow. Further questions should be addressed to acta@mittag-leffler.se.